After discovering Yoga in the mid 1990s I attended classes and workshops with a variety of teachers while working in arts administration, looking to it as a way of staying flexible - very much aware that much of my working day was spent sitting at a desk. After the birth of my daughter, I attended Wenche's Mother and Child classes and my interest deepened; this lead to embarking on studies with the British School of Yoga in 2010, and the completion of a Hatha Yoga Teaching course, supplemented by the invaluable experience of assisting and observing Wenche in classes at the Yoga-Life Studio. 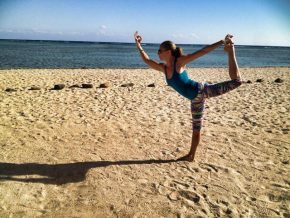 I have experience in running yoga classes for children, the elderly, pregnant women, students, and currently offer regular Hatha Yoga sessions at the Yoga Life Studio, at Herstmonceux Integrative Health Centre as well as at a health and fitness retreat, a care home and a mental health unit. I love helping others to discover what Yoga has to offer them, and feel privileged as I continue to explore its wonderfully energising and deeply relaxing properties. Our friendly Friday morning class is a gentle Hatha Yoga session - starting and ending with relaxation, some breath exercises and incorporating a variety of stretches on the mat and standing postures. A great way to treat yourself and let go of the week in preparation for the weekend ahead. It was something that felt quite natural to me - I had put it off as something I might do sometime, then one day I realised there was no time like the present! I'm not just saying this because you are asking me(! ), but I think of the Yoga Life Studio as my yoga home. It has a very special energy and it's always a joy to practice there. I also love to practice at home (however what was my yoga space has recently been taken over by my daughter's new pet rabbit!) Outdoor yoga is a real pleasure, especially near the sea. Yoga is for everyone... yes, really! Try a variety of classes if you can, so you find the style that suits you best. Take your time, and be kind to yourself. Stay aware of your breath, and whenever in doubt, come back to simply observing it. Don't push yourself to stretch or reach as far as the person on the next mat if it doesn't feel right. It keeps me on an even keel, no matter what's going on around. 1. Many years ago, while studying Art History, I travelled to India to photograph a Persian illustrated manuscript kept in a library, which had once been a Nawab's palace, in a remote town - I have the photographs of the paintings, though not of the trip - it was like a fairytale. 2. Before I was a yoga teacher I worked for an opera singers' agency. Enjoy this invigorating and strengthening side stretch for the legs, waist and back body ~ especially wonderful if you get the chance to take your practice out into the summer sunshine! 1. Step the feet out wide, and turn the right toes out to the right. This back-bend gives a wonderfully energizing stretch to the whole of the body; it stimulates the digestive system as well as promoting strength and flexibility in the spine. Lying on the front of the body, bend both knees, taking the heels towards the buttocks, keeping the feet hip-width apart. Spring is here – and there is something celebratory about Warrior 1, strengthening our connection with the earth as well as lifting our hearts towards the heavens as we reach up. Let’s welcome the arrival of Spring sunshine with an energising practise this month! Celebrate the season with this beautiful, rejuvenating posture which stretches and opens the chest and shoulders while strengthening the legs. Representing the deity Shiva, associated with transformation, this posture provides us with inspiration as we embark on a New Year!